Dr. Mark McFarland joined OSC in 2005. He is a board-certified and fellowship-trained Spine Specialist. His practice is focused primarily on the care and treatment of injuries and disorders of the spine. He specializes in Less-Exposure Spine Surgery (LESS), which is minimally invasive and is less traumatic for the patient. Because of recent advancements in spine surgery technique and instrumentation, many spine surgeries can be performed as outpatient procedures. For most other surgeries, the patient will need to spend only one night in the hospital. 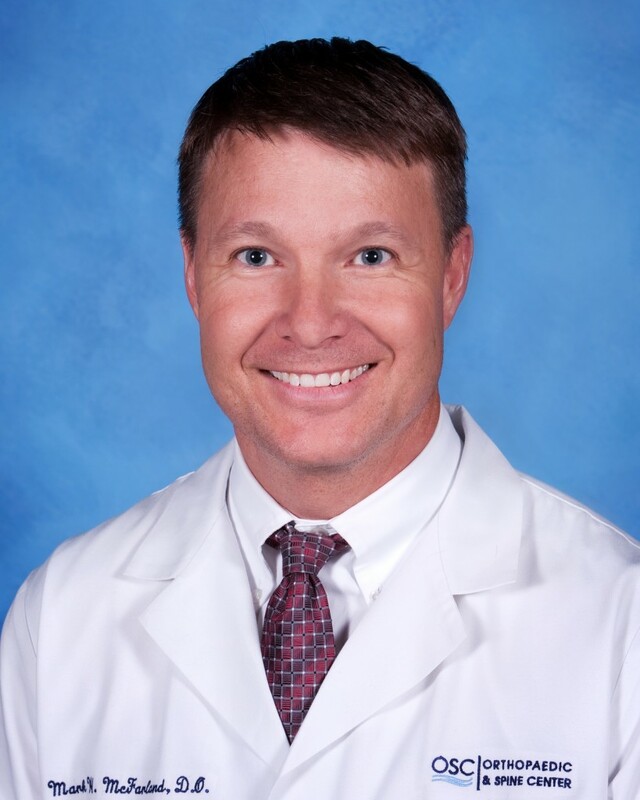 Dr. McFarland also performs knee replacements and he sees patients with general orthopaedic needs as well. In July, 2010, Dr. McFarland performed the first outpatient total hip replacement in the Hampton Roads, Virginia, area, using an approach from the front of the body which spares muscle and minimizes blood loss. The patient went home eight hours after the surgery. We had pre-arranged home health care for this patient, so he was well taken care of when he went home. Dr. McFarland completed an in-office kyphoplasty at OSC in July, 2012, which is believed to be a first in this geographic region. This procedure is typically done in a hospital setting, but because of recent developments, including more sophisticated surgical kits and local anesthesia techniques, OSC is now able to do kyphoplasty as an in-office procedure. Dr. McFarland states that this equipment eliminates (for the majority of people) the need for general anesthesia. As a result, this makes it easy for a physician to do this procedure in an office setting, using live x-ray technology to assure accuracy during the procedure. Dr. McFarland also specializes in osteopathic medicine, which emphasizes health education, injury prevention and disease prevention. In addition to his extensive medical commitments, Dr. McFarland enjoys hiking, water-sports, golf and quality time with his family. To make an appointment with Dr. Mark McFarland, call our office. To learn more about the procedures available at Orthopaedic & Spine Center, view some educational videos in our virtual Patient Center. Introducing the 2018 OSC Top Docs!